Maybe 2017 was a wonderful year for you, filled with health, happiness, bounty and prosperity. Perhaps you felt like the psalmist David, so overwhelmed with the blessings of God that he could barely contain himself, singing: “From where the sun rises to where it sets, you inspire shouts of joy” (Psalm 65:8 NLT). 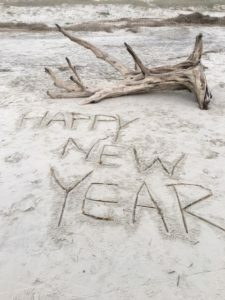 And amid those shouts of joy, David closes his psalm with a description that might top them all in summing up a truly great year: “You crown the year with a bountiful harvest; even the hard pathways overflow with abundance” (Psalm 65:11 NLT). If that describes your experience in 2017, then good for you. It is mighty fortunate for one to find that even his or her hardest roads during the year overflowed with an abundance of bounty. The fact is, whatever our experience of 2017, none of us knows what 2018 holds in store. We may have tried to plan out the year precisely, filled with resolution, will-power and discipline, but we all know that our best plans can change in an instant, derailed by a call from a doctor, or the state trooper, or the late Friday word that “the boss wants to see you” — any or all sorts of contingencies beyond our control. May you step out into the uncertainty of this New Year and firmly grasp the hand of God, finding it to be a better way than you have ever known.